Welcome to Day 15 of the 31 Days 31 Printables series. If you’re just joining us, I’m spending the whole month of October sharing at least one free printable each day. Right now I’m working on updating my holiday planner printables, and I’m loving how they are turning out. Two of the holiday printables have been driving me nuts pretty much from the moment I made them. Don’t get me wrong, I love the information they store, but they just weren’t working as well as they could have been. 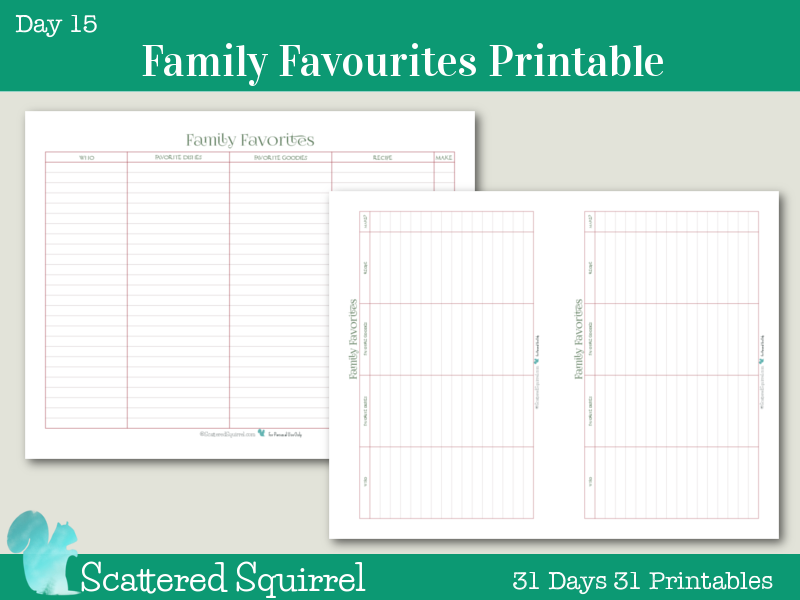 So today I’m sharing my new version of my Family Favourites printable. My old holiday planner printables contained two family favourites printables. One to keep track of favourite dishes and one for favourite goodies. I love being able to see at a glance who likes what. It makes planning what I’m going to bake or what dishes to include in our holiday meals. What I didn’t like so much was the layout, or the fonts, or really anything about them. While they were great a place to jot down the info, they weren’t really set up for ease of use. I’ve been itching to update them, and this month was the perfect time to do it. In the end, I opted to keep it really simple with a spreadsheet like layout. Columns allow me to easily scan the items on the lists making menu and baking planning a breeze. 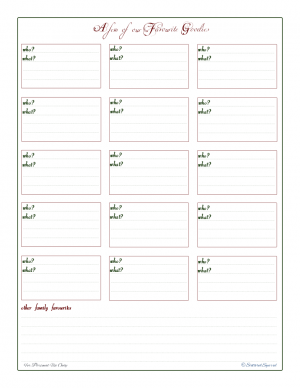 Just like the other holiday planner printables, I couldn’t resist making a half-size version. Again I kept the layout the same, opting for simple over convoluted. It is just a mini version of its big brother. 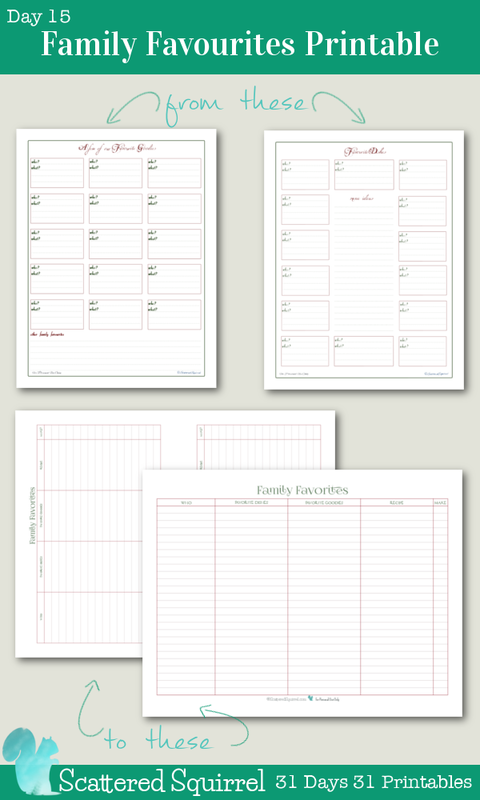 I am really looking forward to using the new and improved family favorites printable this year, and in years to come. 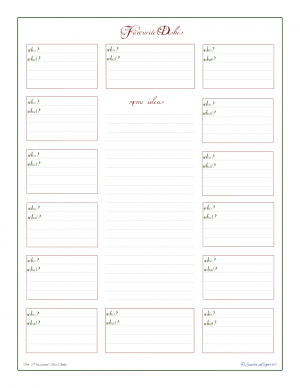 By simplifying the layout and combining the two versions into one, not only is my planner going to be a little lighter, but planning our holiday meals this year are going to be a breeze! When you’re planning a holiday meal, do you like to include all your family’s favourite dishes?